Enough Said will always be remembered for being James Gandolfini’s final lead role before his premature death last summer, and it’s a bittersweet performance. 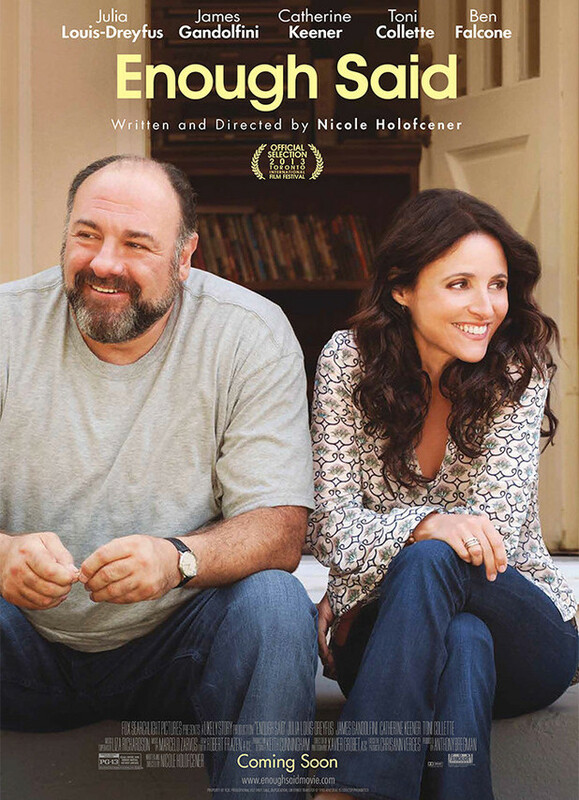 Gandolfini plays Albert, a sweet, gentle giant of a man who catches the interest of a masseuse named Eva (Julia Louis-Dreyfus). Both are single parents and relatively recent divorcees, and they are each struggling to come to grips with their daughters leaving for college. When the two of them meet at a party, they amusingly bond over how they aren’t attracted to anyone there. A little bit of flirting leads to a first date, and the two seem to hit it off from there. Both characters are lonely souls with little in the way of friends. 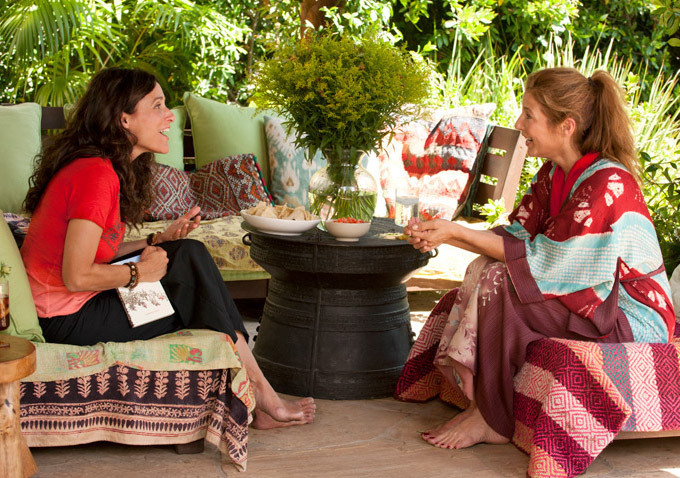 However, at that same party, Eva gives her business card to a poet named Marianne (Catherine Keener). At their first meeting, the two of them start talking and develop a friendship of their own. Things seem to be looking up for Eva, who now has a new love interest as well as a good friend. Naturally, there’s a wrinkle in her newfound relationships. There’s a pretty significant plot twist here which I won’t reveal (though you will probably be able to guess it within moments of the film starting), and it causes the film to dig deeper into Eva’s personality. She learns things about Albert from a biased perspective, and it causes her to look at him in a different light. This actually amounts to a fairly conventional romcom plot, but it works here because of the great characters within. Louis-Dreyfus and Gandolfini have a strange, enigmatic type of chemistry between them, and they are completely believable as a new couple. Albert is a self-proclaimed slob (though not the hoarding type, he says) and maybe a bit too simple-minded, but it’s clear he has a good heart, and Eva is drawn to him right away. The banter between them is well-written and often funny, and nothing feels forced. Gandolfini plays against type here, and his performance is so strong that it makes it even more depressing that he is no longer with us. I would have loved to have seen him take on other parts like this, which is about as far from Tony Soprano as you can imagine. Louis-Dreyfus is also in excellent form, and it’s great to see her in a rare lead role. Catherine Keener, Toni Colette and Ben Falcone round out the supporting cast, with each playing small but pivotal roles. Enough Said isn’t a complex film, but it is a well-made one. It’s the rare romantic comedy (a middle-aged one, at that) that isn’t too saccharine, and it’s genuinely funny more often than not. Don’t let this one slip under your radar. Great review Eric. I had dismissed this one originally but it’s had some really good reviews. Quite fancy checking it out now. Thanks man. I was initially drawn to this only because of Gandolfini, but it turned out to be quite a good film. Well worth a look. I really want to see this one. Fine review, Eric. Thanks, Michael. Hope you enjoy it as much as I did. Good review Eric. Even while this is one of the most pleasant, joy-filled movies of the year, it still stands as a sad piece of reality that the talent of James Gandolfini is lost, and he surely will be missed. Yeah, as great as Gandolfini is in this film, it’s depressing knowing that this is one of his very last roles. Reblogged this on Entertainment Source Collector. Wasn’t thinking of letting it slip. The solid reviews it has gotten are enough to make me hesitate if I ever had a doubt. I’m a fan of Louis-Dreyfus from Seinfeld and I very much respect the body of work of James Gandolfini, who was never bad in anything, and often extraordinary. There are even hints of Elaine Benes in Louis-Dreyfus’ performance in this. I’m sure you will really appreciate the film as a fan of both actors, Niels. I’m definitely going to have to seek this out… I’ve also been meaning to get that Rolling Stones movie that him and David Chase did together that I see in my local redbox every time I go to rent something. Nice work man, and a damn sad loss for sure. Hmm, I’m not familiar with that Rolling Stones film. Do you remember what it’s called? I’m curious to check it out. I missed the screening for this but it looked really good! I definitely will rent this one, glad to see a rom-com that’s well-made and not just for the young’uns! Thanks so much, Ruth! It looks like I got a nice bit of traffic from it. 😀 Appreciate the RT, too! As sad as it is that Gandolfini is gone – this is a nice way to remember him. It really is a great way to remember him. Thank you. Great review! And I completely agree. This is an incredibly sweet, and touching film. In many ways, it is Holofcener at her best. Thanks! I don’t usually go for romcoms, but this one was really enjoyable. Great review. I’m a big fan of the cast and they were all wonderfully charming. James Gandolfini will be missed. Thanks! I was pleasantly surprised with how much I enjoyed this one.